Lately, I've been loathe to blog out of fear that it'll lead too much procrastination (which would be especially bad since I think the "just right" level of procrastination is roughly a 40 hour a week job in and of itself). So, in an effort to make sure this blog promotes rather than detracts from my research efficiency, I'm instituting the following feature seen elsewhere around the web, The Whiteboard of the Week. Not only will it me encourage me to produce at least one tangible piece of evidence a week that I've done work, but also it will encourage me to clean up my messy whiteboard writing. 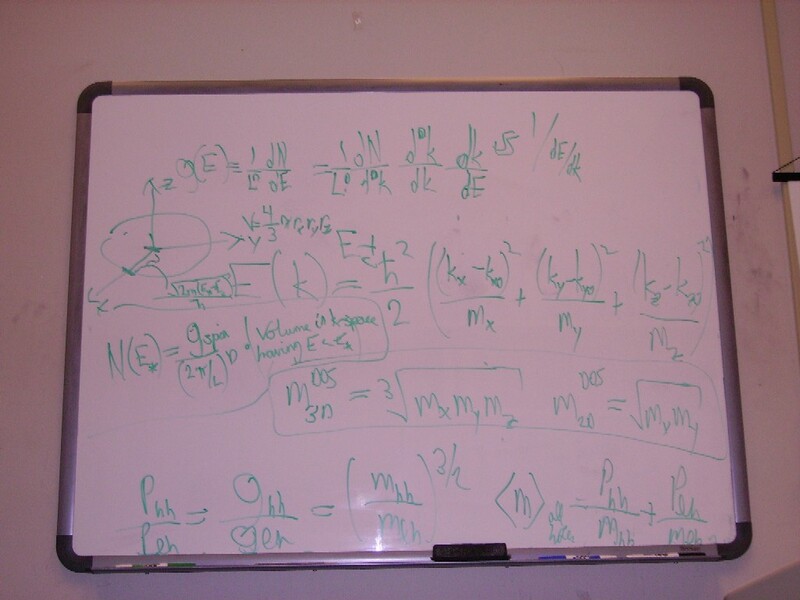 This week I'm focusing on TAing MIT's introductory solid state physics course for first-year electrical engineering grad students, and thus my office whiteboard today looked like this.